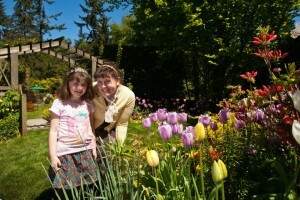 Good relationships require special care, and the intimate garden of PowellsWood is one super place to cultivate family bonds over Mother’s Day weekend. Whether it’s reminiscing about the old days while surrounded by spring blossoms, or introducing a new generation to an English-styled elegant experience, PowellsWood can’t be beat. Called Federal Way’s “Secret Garden” by many, PowellsWood’s hedged walls and lay of the land create the illusion of being farther from the surrounding urban neighborhood than is actually the case. Mature trees and densely-planted perennial beds impart a sense that this garden has existed far longer than its twenty-five years. A stroll through this English-inspired garden has the power to transport you into another time and place… as completely as a flight across the Atlantic, except without the threat of fisticuffs or being barred on re-entry! The garden’s standard admission rates apply this weekend, a bargain at $7.00 for adults and down from there. Children 5 and under are free. Catch up over a pot of tea and goodies in the Garden Sun Room or on the patio. I can personally vouch for Diane Powell’s culinary expertise; you will love her lemon bars, 7-layer bars, shortbread, and chocolate chip cookies. Her scones with clotted cream are also not to be believed. No reservations are needed; just drop in for tea from 11:00 am to 4:00 pm. The garden will be open from 10 to 5. After snacking, take an unhurried, exploratory stroll through the garden using the garden’s updated visitor’s guide and interpretive materials. Benches spaced throughout the garden rooms provide the perfect location to linger over a good conversation. Light picnicking is also permitted. Sunday from 11:00 am to 1:00 pm visitors may enjoy the music of harpist Victoria Norman. Ms. Norman will play a concert on the Garden Sun Room patio. Concert is included in garden admission. A shuttle is provided from Sacajawea Park lot, just east of the garden at 1401 S. Dash Point Road; no on-site event parking is available. You won’t be waiting long for the lift, though, as PowellsWood’s new shuttle runs continuously. If you haven’t visited before, why wait any longer? Make Mother’s Day extra-special without a lot of hassle. Visit PowellsWood.org for more details.